Every year, U.S. Customs and Border Protection (CBP) is required by law to provide a report to Congress regarding enforcement of antidumping and countervailing duty orders over the prior fiscal year (FY). CBP’s report for FY2016 was presented to Congress on November 17, 2017, but was made available to the public for the first time this week. The United States operates a “retrospective” system of assessing antidumping and countervailing duties. This means that in response to unfair trade that has materially injured a domestic industry, the U.S. government requires importers to deposit with CBP estimated antidumping and/or countervailing duties at the time imports are entered into the country for consumption. Following importation, foreign exporters, U.S. importers, and U.S. domestic producers have the option of asking the U.S. Department of Commerce (Commerce) to review an exporter’s sales over a prior period of time to determine a final liquidation (assessment) antidumping and/or countervailing duty rate. If the final liquidation rate is less than the estimated amount that had been deposited with the imports, CBP issues refunds to the importer. If the final liquidation rate is higher than the estimated amount deposited, CBP issues a bill to the importer to collect the additional amounts owed. CBP’s report to Congress indicates that the agency collected $49.1 million in antidumping duty cash deposits on imported shrimp in FY2016. Based on the data in previous CBP reports to Congress, the agency has collected over $200 million in antidumping duty cash deposits on shrimp imports over the five year period between FY2012 and FY2016, as shown in the table below. 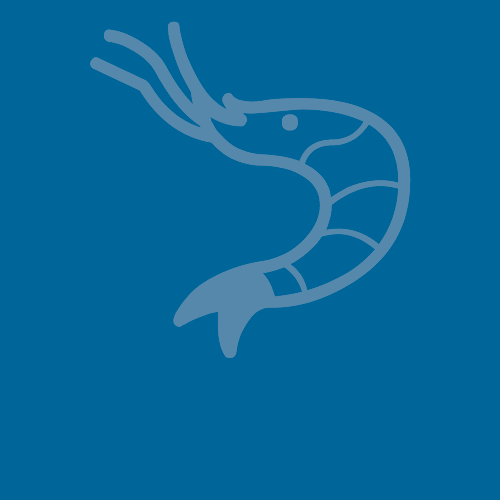 Shrimp imports account for a major portion of the total value of all imported goods subject to antidumping duty orders. In FY2016, according to CBP’s report, shrimp imports comprised 23% of the total import value subject to antidumping duties. CBP also reported that the agency liquidated (assessed) nearly $124 million in antidumping duties on shrimp imports in FY2016 on imports that had previously entered the U.S. market. In total, shrimp imports, on their own, accounted for nearly $1 out of every $5 in antidumping duties liquidated (assessed) by CBP in FY2016. The liquidation of antidumping duties is the first step taken by CBP in collecting antidumping duties owed to the U.S. Treasury. CBP’s ability to collect on bills issued as the result of final liquidation rates that are higher than the estimated cash deposits made at the time of import entry is limited. In the agency’s report, CBP explained that, as of the end of FY2016, the agency had 54,704 unpaid antidumping and countervailing duty bills, totaling approximately $2.8 billion in outstanding debt. Although uncollected antidumping and countervailing duties have been a major concern for both CBP and Congress, this problem has not impacted shrimp imports significantly. In total, CBP reports that there were $13 million in uncollected antidumping duty bills outstanding on shrimp imports at the close of FY2016. In comparison, as shown in the table below, most food products subject to antidumping duty orders are characterized by massive amounts of uncollected antidumping duty bills. When coupled with import volume and value data, CBP’s data demonstrate that the antidumping duty orders on shrimp have been effective. U.S. importers have been required to deposit tens of millions of dollars in estimated antidumping duties each year in order to counteract unfair trade practices. 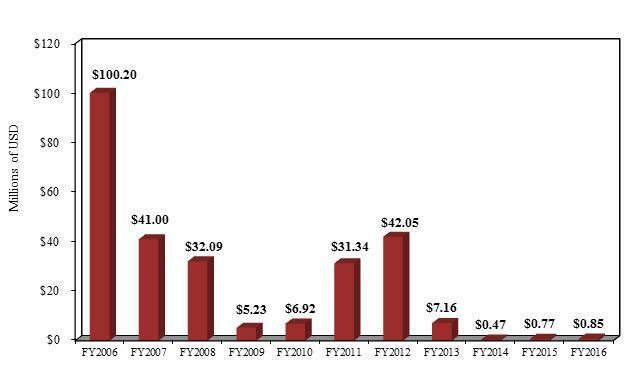 Final liquidation rates established after Commerce’s review process result in the assessment of duties that are, in fact, collected by the U.S. government. These conditions are unusual for food products subject to antidumping duties. In addition to experiencing substantial uncollected antidumping duties on past imports, the amount of antidumping and/or countervailing duties deposited at the time of importation of food products is limited. The total amounts deposited in FY2016 on a product basis are summarized in the table below. 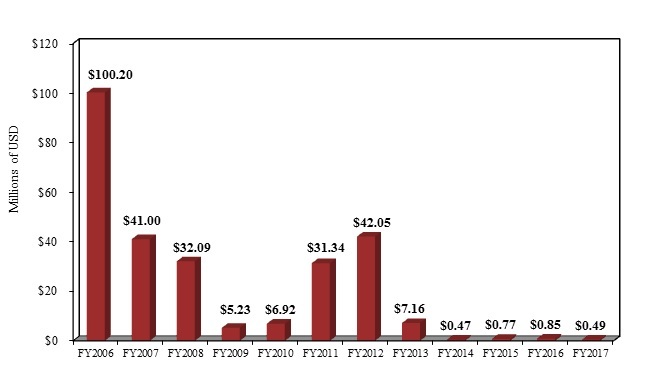 The antidumping duties ultimately collected by CBP on shrimp imports that entered the country after October 1, 2007 go to the U.S. Treasury and are part of the general revenue of the U.S. government. As an industry, U.S. commercial shrimpers compete in international markets without the benefit of subsidies from their government. In stark contrast, shrimp producers and exporters in many other countries enjoy the support of their governments when targeting export markets, such as the United States, for sales.